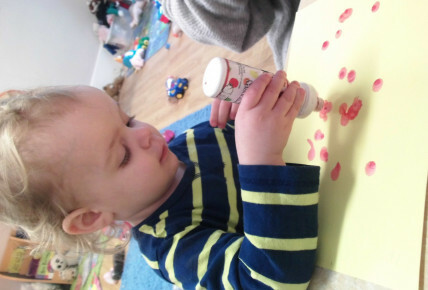 The children at nursery loved engaging in various activities to celebrate mothers day. 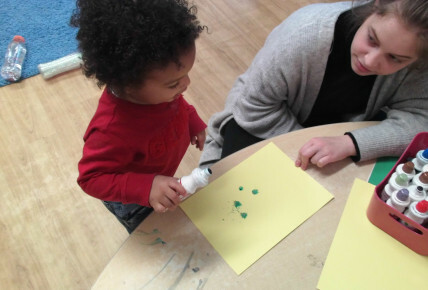 Under 2s enjoyed creating a unique mothers day card with their own personal touch. 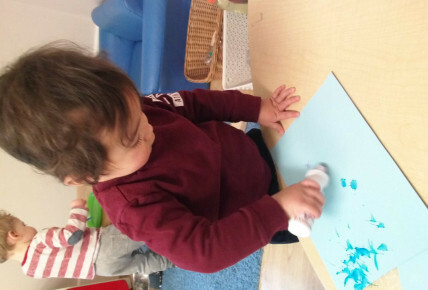 We provided the children with card and dabber pens, the children then dabbed the pens all over the card, creating bright colourful marks; Natan especially enjoyed this and took his time whilst doing it. We then took pictures of the children with their arms in the air then printed and cut around their bodies. Once cut out, we got the children to stick the picture of them onto their decorated card and to stick a heart shape above them- this gave an illusion that the children were carrying the heart. During the activity Oliver said “Heart” whilst pointing to the heart. The parents were thrilled to see the artwork their children had created when collecting. Pre-school had lots of fun making flowers for mother’s day. They got to cut out their own flower and colour it in, using colours of their choice. The children then got an opportunity to use sticking materials to decorate the flower however they liked. Once finished, the children independently wrote their own name on the back of their masterpiece. During the activity, pre-school enjoyed engaging in a conversation about mothers day. Holly said “Daddy said I can buy mummy a present for mothers day” A group of children engaged in a conversation about mothers day, each of the children were showing their different opinions and views towards it. Some children said “Mothers day is for mummys and daddys” , others said “Mothers day is only for Mothers”. Ducks and Hedgehogs engaged in 2 activities for mothers day. The first activity was creating a display board for all parents and visitors to admire. The staff supported the children whilst they cut out big hearts. The children then independently painted their own hearts, using paint brushes and various coloured paints. The hearts were scattered around the edges of the display boards. In the middle of the board, there are speech bubbles, each bubble quotes the children’s words. Phoebe said “I love mummy”. In the next activity, the children got to decorate flowers. Each child smiled for a photo and these photos got printed off. Once printed, the children were supported whilst cutting around their face. On each individual flower the child’s face was stuck in the middle, adding another personal touch.